It all started with a bite. When you are watching portions, sometimes deceiving your eyes is key to success. I use a few tricks. Smaller plates for me and larger plates for my husband. Correl has a great set for that. Another truck is filling the bottom with more veggies. As you see below, it was pasta night. 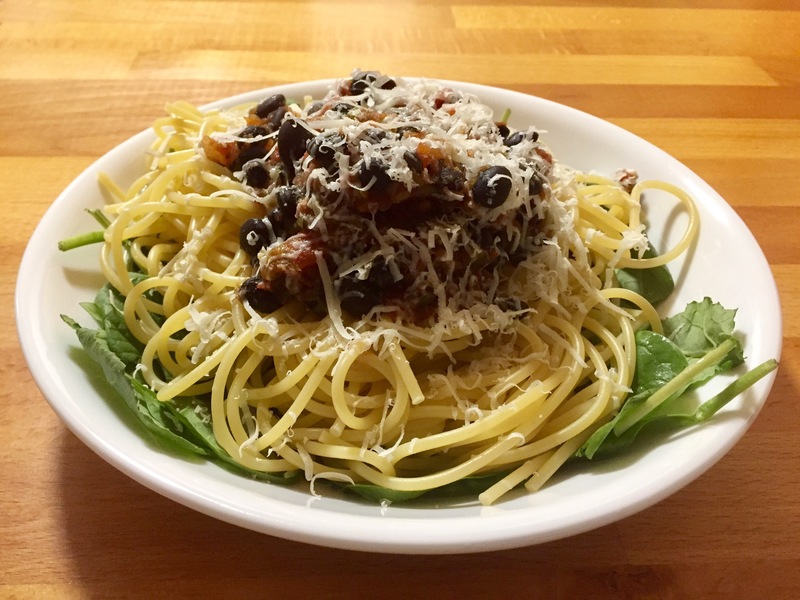 I added spinach to the bottom of the plate, put the pasta on top with tomato black bean sauce and a little cheese. This looks good, and I believed I had a huge plate. Don’t tell my stomach, it never realized. If you have tricks please feel free to pass them on. Have you ever watched a show and “Oh I have to try that”? Well that is what happened to me last week. I will not take credit for this recipe as I saw this on YouTube. Asian at home. You have to check her out. This is a healthier version of ramen noodles. Anytime I know and control what I put in, makes me happy. You can really have fun with this. You pick the protein, the spice, the flavour, vegetable, the noodle and the next time something completely different. This is a great way to use leftovers. You can make it as healthy as you like or need. Lower smart point proteins like shrimp, less noodles more vegetables. You choose what you like. 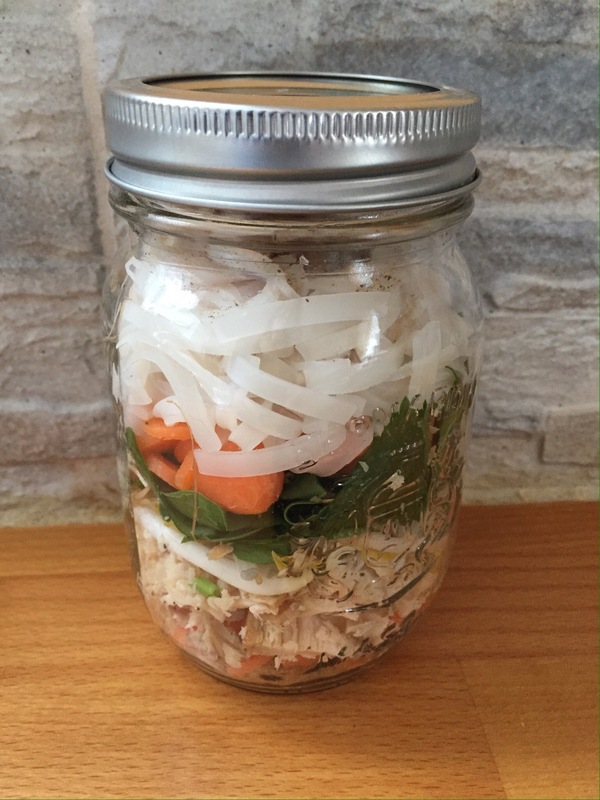 My first version was vegetable broth 1/2 cube, 1/2 a small roasted chicken breast, spinach baby carrots sliced thinly, broad rice noodles cooked,salt, pepper, dried rosemary and oregano and a few drops of hot sauce. 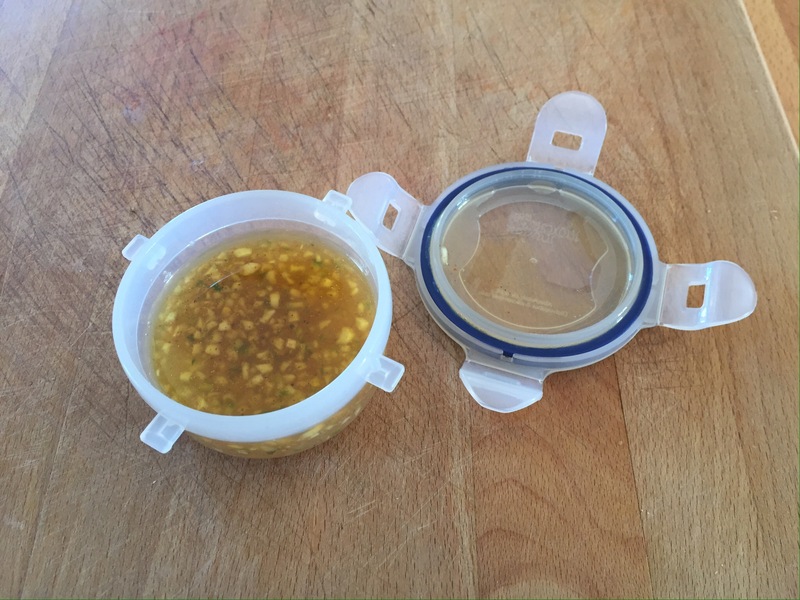 When ready to use, you pour boiling water, fill and shake. For my first try, not bad but lacked a little flavour and heat for my taste. Of course I tried again. 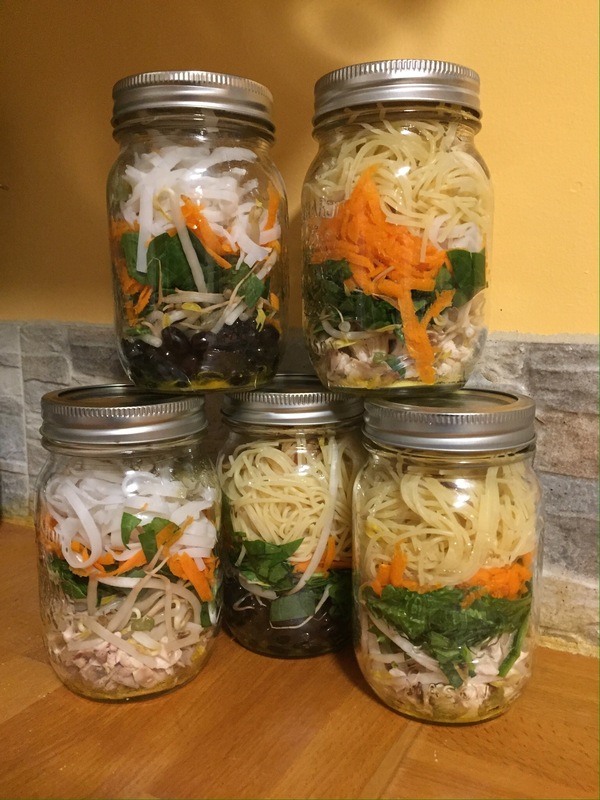 I changed the noodle to capellini, the protein to black bean, carrots became shredded carrots, spinach became kale, spices were a creole mix, and sriracha chili sauce. Try it and have fun. I know I did. I personally hate the word diet. As one of my favourite artists says “if I could kill a word” -Eric Church, this is one word I would erase from the vocabulary. It is a temporary fix to a bigger problem because the problem keeps coming back again and again. How often have we said in our lifetime, tomorrow I start this new diet, tomorrow I will start to exercise, tomorrow I will research what I need to do about getting healthy. Well I hate to break it to you but tomorrow never comes. Tomorrow will always be tomorrow. We have today and there never is a better time than right now. You don’t start by saying I will cut out all fat, sweet, salty foods in one shot. You don’t start with I will work out 2 hours very day. Everything done well takes time. Every small improvement makes a drastic change in the long run. Planning is important. Start with a simple plan to take 15 minutes a day to do something good for you. A short walk, cutting veggies for the next week’s lunch snacks for you, prepare your menu for the week so you don’t lose that 10 minutes wondering what will I make tonight while you are snacking on anything you can get. You are worth that 15 minutes. Once you have mastered that, you add a little time, a little more intensity and a little more fun to it. You have no idea how much you can achieve starting with that simple 15 minutes. Have fun in all you do and you succeed. This is a tangy salad dressing with a kick. I read, in one of my chefs books, that a perfect salad dressing is made of three equal parts of acid, base and sweet. I believe this to be true and you can alter this basic recipe to suit your palate. After all, cooking is all about experimenting and having fun. Here is the basic recipe, enjoy and remember to make it your own. Mix all ingredients well. Refrigerate. Best when it has time to have the flavours blend. Approximately an hour. We all need treats. For all of us that have a sweet tooth, one of the hardest things to do is just have a little. How often have we bought a chocolate bar and said I will have only a couple of pieces. Next thing you know the whole thing is gone. I am guilty of that. Well the power of suggestion is a powerful tool. Yes, I know, I am just fooling myself but hey it works. 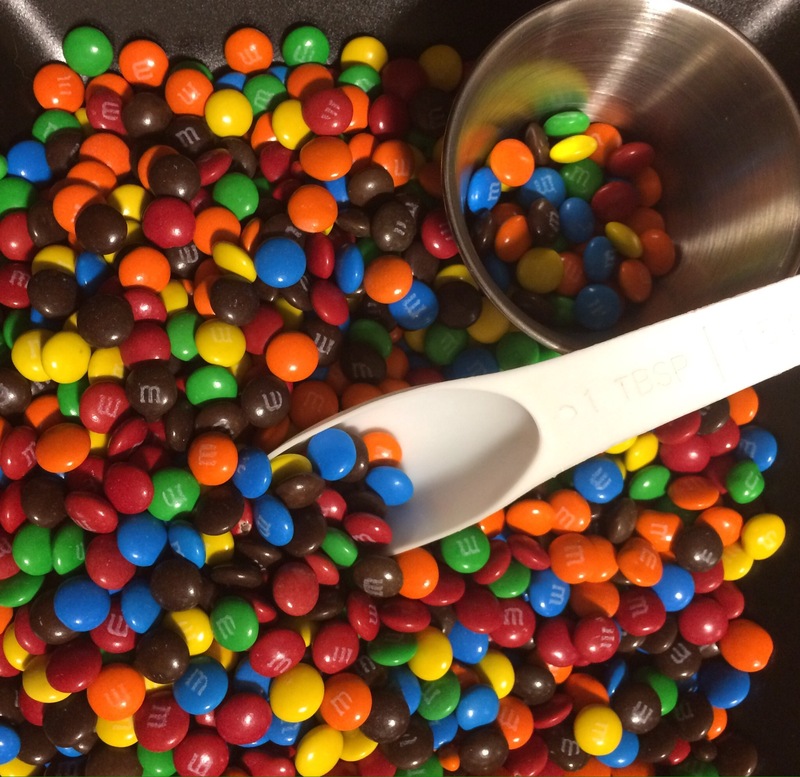 I love my mini M & Ms. To stretch out the pleasure, I measure out one tablespoon, put them in a tumbler or short shot glass and eat them one by one. One tablespoon gives you between 25 and 30 treats. If you let them melt in your mouth until the shell cracks and the chocolate oozes onto your tongue, it can prolong the pleasure. I can watch a whole hour episode on one tablespoon of these little treats. 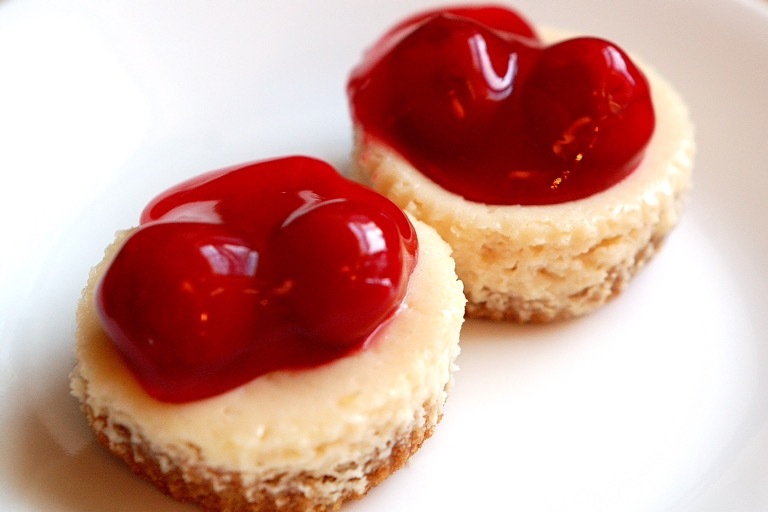 Savour them so you can appreciate the treat. Enjoy. This is a quick easy dinner. 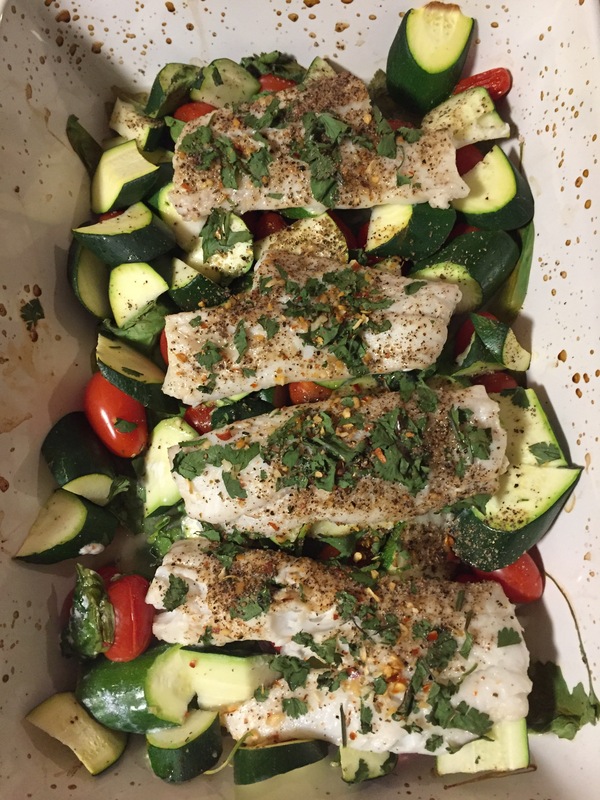 Cod is a great fish that is low fat with lots of protein. As Chef Michael Smith would say, make it your own. If you don’t like Cajun spices use a spice you prefer. Make it with a different vegetable as a variation. Have fun. Protein is an essential part of our diet. Some proteins are healthier than others and some are quite expensive. One of the most inexpensive, versatile and tasty proteins I have found are black beans. You can get them in a can which are precooked, preferable the sodium reduced kind. They are convenient and inexpensive. Personally I prefer the dried beans that I soak overnight and cook the next day to my preferred tenderness and flavour. I will sometimes add a jalepeno or two for some kick. These great little beans can be used in soups, dips, with eggs and salsa, and even in brownies. Yes you read that correct, brownies. Don’t knock it until you tried it. Total Carbohydrate 63 g. /. Dietary fiber 16 g. /. Sugar 2.1 g /. Protein 21 g. /. Who says light means bland. 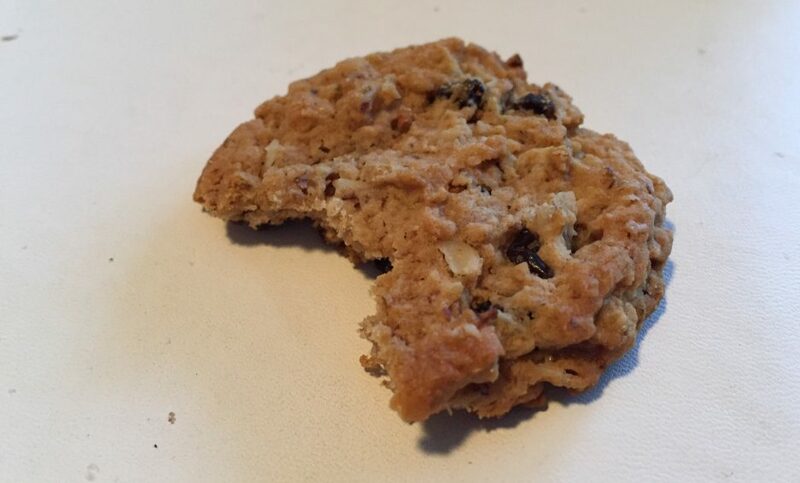 Here is a weight watchers recipe that I have made for people who are not concerned with their weight and they loved these. Spoon 1 tablespoon of crumb mature into each liner and press down gently. This is an old Weight Watchers recipe. New Value is 5 smart points per serving. Some things just taste great even if they are low in fat. Note: Batter will be kinda thick. If too thick for your taste, add a tablespoon of water until desired consistency. Heat large skillet, spray with nonstick spray, pour two large heaping tablespons of batter and cook as you would any other pancake. Often maple syrup crystallizes at the bottom of the glass syrup dispenser. By fluke our glass dispenser broke so we were left scrambling for another option. We had just finished a Heinz ketchup squeeze bottle. After a very complete wash, we filled it with a can of maple syrup. It works likes magic. No spills, no sticky residue on the side, and best of all no crystallization at the bottom. We are not sure why it works but we aren’t going to complain.